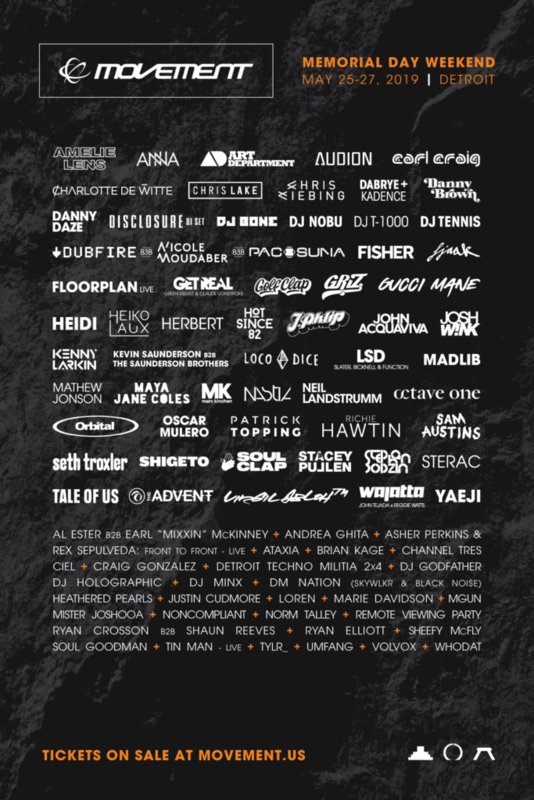 Movement Music Festival, one of the longest running and most acclaimed electronic music festivals in the world, is pleased to reveal the full lineup for 2019, taking place Memorial Day Weekend, May 25-27 inside Hart Plaza, Detroit’s legendary riverfront park. Since its inception, Movement has been deeply dedicated to bringing a completely original experience to Detroit, the place where it all began for Techno music. Festival organizers are hyper focused on showcasing authentic talent for the event, which in turn provides an experience that is purely about the music. Movement fans will find themselves immersed with the best of the best, seasoned vets and up and comers within Techno and other dance music genres.Festival organizers Paxahaupreviously announced a lineup preview, which included UK dance music pioneers Orbital, who will be performing live for the first time in Detroit in almost 20 years; as well as Amelie Lens, Stephan Bodzin- live, Chris Lake, Danny Brown, Hot Since 82, Floorplan – live, DJ Nobu and Heiko Laux. Today’s announcement features 79 additional acts, including GRAMMY-nominated producers Disclosure, who will be performing their acclaimed DJ set packed with new material and exciting production elements. Other notable acts announced today include Michigan native and “future funk” trailblazer, GRiZwho will be bringing his acclaimed live show to Movement; a special b3b set from Techno stalwarts Dubfire, Nicole Moudaber, and Paco Osuna who are reuniting after a legendary performance at Nicole’s MoodRAWnight at Output in New York; Off-White founder and Louis Vuitton’s artistic director Virgil Ablohdelivering an exclusive DJ set exploring the robust relationships between fashion and music; Superstar MC and trap music pioneer Gucci Mane; and Korean-American artist and rising global sensation, Yaeji, who is known to blend both House and Hip-Hop coupled with lyrics in both Korean and English. Complete lineup listing can be found below.